Step by step we have to apply changes to our network. We have more and more devices in the rooms which are connecting to the internet. But you share 255 IP-addresses with about 200 other rooms. Which means if you use more than one address there is a high chance that somebody else is not getting one. For that reason we started to limit the addresses in WHO and in the French Quarter to 1 per port. 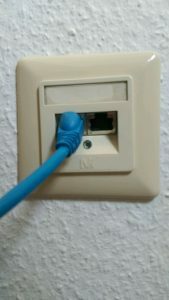 This means only the one device connectet by cable to the socket gets an IP-address from us. This does not mean that you can not operate your own wi-fi. It only means that router which work as a network bridge do not work anymore. From now on you have to set up your routers in NAT-mode.If you have trouble doing so please visit our consultation hour on Friday between 15 and 17 o´clock or read here. Last week there were a couple of new room mates coming to us who tried to get online via the “short black cable”. This cable belongs to the heating control. There is no internet in the heating. Please search for the network socket in your room and plug in your own cable there. Your WIFi is not woking anymore, please read here. ➜ Your WIFi is not woking anymore, please read here. PS: Now we changed it in the Hartmeyerstraße too. PPS: We had to limit Fichtenweg 7 too. PPPS: Hohenheim eund Eugenstr too. There were several reports of WiFi routers/ access points, which lost there connection and had to get restarted. We are trying to fix this problems and did therefore some changes in the settings in the Hibuka/ Frantoesisches Viertel. If your WiFi stopped to work today spontaneously, you had it misconfigured and were probably the reason why your room mates had problems. Follow our manual to setup your WiFi and it should work fine again. Feel free to visit us or just call us. We’ll be here in the Fichtenweg till 5 pm.